You can use online resources for writing your biographical sketch. One site that assists you with creating your autobiography is Story of My Life. Story of My Life contains a simple way to assemble chapters together to form your biographical sketch. Go to the Story of My Life website. In the top-right corner, click the Register Now image to register for free. The confirmation page appears. You should also receive an e-mail confirmation. To progress to the next step of the registration process, confirm your e-mail address. Go to your e-mail program and open the confirmation e-mail from Story of My Life. The title of the e-mail is Registration | Email Validation. Open the e-mail and locate the link to validate your e-mail. Click the link in the e-mail to validate your e-mail address or copy and paste the validation link into your web browser. The web page shows that your e-mail address has been verified. The page also allows you to choose a Forever Space package, which requires payment. Don’t panic! You don’t have to purchase a plan to use the site. If you’re not interested in purchasing a package, just make sure to choose the I Will Buy Later. Continue with My FREE Story Account option. Click the green Continue button near the bottom of the screen. The next page in the registration process is the Checkout page. If you don’t want to order anything, make sure the package is set to Free and the total at the bottom of the page is $0.00. 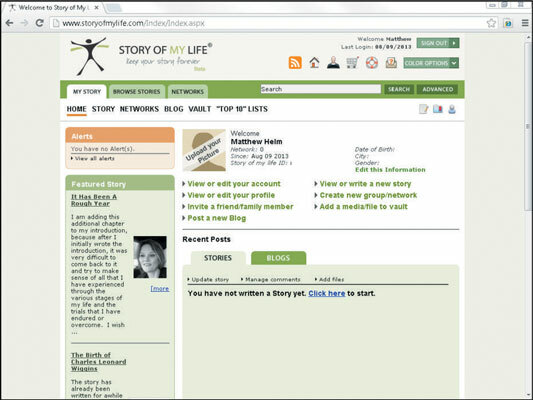 The My Story page appears. Click the Click Here link (in the middle of the page, under the Stories tab) to begin writing your story. You can add chapters or categories by using the prompts under the My Story menu on the left.